The ConvertBack method of a value converter is used to convert from a binding target (e.g. the attribute of a control) to a binding source (e.g. a property). Below is a simple example, showing how we can convert from a Slider value to the square root of the selected value. 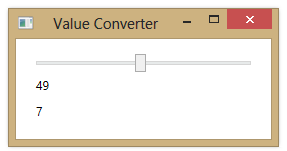 In XAML, we have a Slider that ranges from 1-100 and binds to a property that is meant to store the square root of the selected value. We specify a binding Mode to indicate that binding should only map from the target (the Value property) to the source (the SqRootValue property) and not in the other direction. We then include labels that bind to the Slider’s Value property as well as the SqRootValue property. In the value converter, we just take the square root of the current value, calculating the result in ConvertBack. This Example does not work anymore with .NET4 because the Convert method is not implemented. I just double-checked and the example worked fine in both 4.5 and 4.6. You don’t need Convert implemented if you’re OneWayToSource binding.